The equator runs through Colombia, so — on a flat map — it looks consistently tropical. But the dizzying heights of Machu Picchu’s Andes don’t end abruptly at the Peruvian border, instead pushing northward, splitting into three fingers (known as cordilleras) of snow-capped and volcanic peaks divided by deep river valleys. Bogota sits along the eastern finger, the fourth highest capital in the world — after Bolivia’s, Ecuador’s and Bhutan’s — at 2625 meters (8600 ft.). Medellin is on the middle finger, both geographically and possibly culturally, at 1494 meters (4900 ft.). 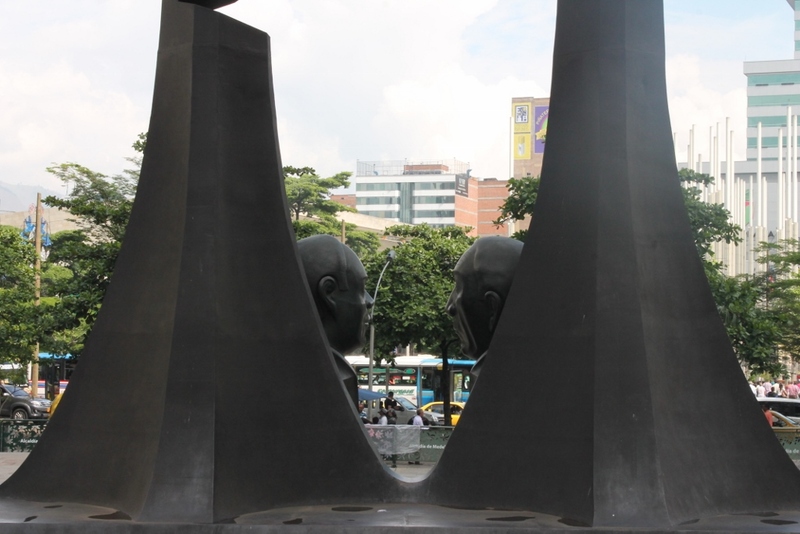 Medellin sits in a giant trough, a city of three million strung out along the Rio Medellin, hemmed in by jagged peaks. The shallowest slopes are covered in dense deciduous forest but others — from a plane or a distance — look like northern California in springtime, green and smooth. Their prized Metro and the main roads run along the river, where the desirable (flat and tree-shrouded) real estate lies. But the valley floor is narrow, only a mile or so across in many areas, and pocked with smaller hills. We live on the easternmost edge of the valley floor, toward the south end. Behind our apartment complex, the roads slope upward precariously, winding up an almost-cliff and over the ridge to the airport, which is in the next valley — even higher than Medellin and home to mile after mile of greenhouses (since Colombia is the second-biggest flower exporter after the Netherlands), and dairy cow breeds unexpected in equatorial countries. In an rare nod to road safety, the streets above us are peppered with speed bumps to slow down the too-scary-to-be-entertaining drivers, meaning if they aren’t braking for a curve, they are braking for a bump. Here, the sound of bare brakes, worn down to a teeth-clenching metal-on-metal squeal, is ubiquitous. Throughout Colombia, in an almost-Germanic example of order, streets are named with an algorithm that easily pinpoints locations. All north-south roads are numbered carreras and all east-west roads are numbered calles (pronounced KA-jay in Colombia, not KAI-yea like in Mexico). The occasional off-kilter street is either a diagonal (more like a calle) or a transversal (more like a carrera). All buildings are numbered relative to their cross-street; this means I can tell you, without a map, that the kids’ Spanish teacher’s apartment at 45-60 Calle 29 Sur is exactly 8 blocks south and 4 blocks west of our apartment at 41-117 Calle 21 Sur (29-21=8 blocks south, 45-41=4 blocks west). On the valley floor, this works beautifully, but it gets a bit messy on the slopes, where the roads change back and forth from calle to carrera, double back on themselves and split into three arms of the same calle, which they attempt to order by labeling A, B and C.
At our end of the valley, the apartment complexes get ritzier and the shops more expensive as you climb. There are more taxis than buses, and the buildings are tall and surrounded by trees and razor wire. 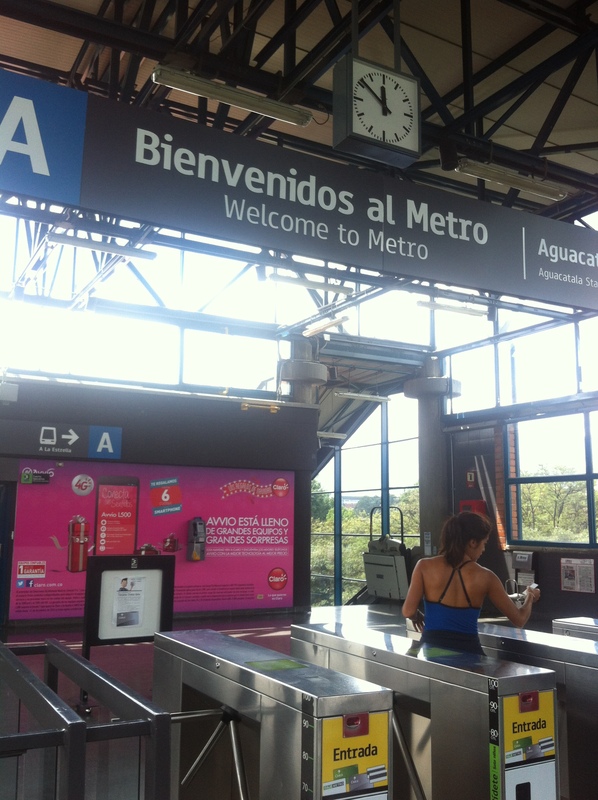 But in Medellin proper, a rise in altitude marks a drop in socioeconomic status. The middle class crowd the flatlands and the slums slop up the hillsides. Metro-linked gondola lines as part of an urban renewal/poverty-and-crime-eradication plan to connect some of the toughest neighborhoods to the rest of the city. What was a two-and-a-half hour trip on foot (and impassable for buses) is now a smooth 20-minute gondola ride, and the parks, libraries and lovely(ish) urban spaces built around each station have allegedly changed the tenor of the neighborhoods. There is, however, some discrepancy between what the tourist books claim (urban planning success!) and what locals say (still awful, dangerous and controlled by exortionists and gangs). Medellin is a fascinating stew of the first, second and third worlds. The favelas up the slopes. The wandering street vendors chanting underneath a back-breaking load of fruit or juice. The un-subtle junkies and prostitutes downtown, missing limbs and the occasional military presence. These all scream developing world. But the pedestrian streets full of high-end knockoffs, the respectful and ubiquitous policemen, the well-organized yet lung-choking public transport system, and the intimidating governmental plazas remind me of Athens, and late-90s Eastern Europe. Then there are apartment complexes like ours, with fresh-swept playgrounds, numbered parking spots and marble elevators. And the local Carulla grocery store, full of wine, Greek yogurt and bags of pre-washed lettuce. Envigado’s chic, side-street restaurants with air-plant walls and heavy wooden tables touting artisanal meats. These are definitely first world ingredients. And they are all stirred together in this always-75-degree bowl high above the equator.